July 6, 2016 - Falcon Heights, Minnesota. Black guy shot for driving while black. 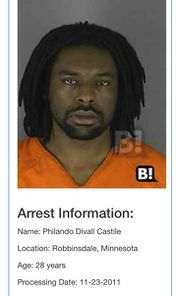 A woman (Diamond "Lavish" Reynolds) claiming to be the girlfriend of Philando Castile posts a Facebook Video Stream of herself telling a story about how her boyfriend was pulled over for a broken tail light, had a license to carry a gun (and told the cop about it), and then the cop told him to get his ID, and when he reached for it, the cop unloaded and shot him. Because that's what cops do to innocent black men. Right? Then the media had a field day reporting everything the family said as fact (without checking them), eulogizing this poor innocent black cafeteria-worker shot by another heartless white cop. He was murdered in cold blood for following directions, after being pulled over for a broken tail light. And that's where the gullible stopped listening. Officers Jeronimo Yanez (Asian) and Joseph Kauser pulled over Philando because he fit the description and looked like someone who had committed a July 2nd armed robbery of a liquor store, stealing the cash in the register and a carton of Newports, and a BOLO had gone out. The officer pulling them over said as much on radio dispatch. (Basically, Philando and the suspect were both tall, skinny, black guys, with dreadlocks, a mustache and wispy beard). When the Family listened to the recording, they implied that it was just racial profiling and pushed the "all blacks look alike" hotbutton. Philando had a long list of driving offenses (over 86 misdemeanors on over 50 pull overs), most of them minor traffic violations like driving on a suspended license. Again, instead of owning any of it, the family claims that was all because he was DWB (driving while black), and pushing racial hot-buttons again. As if Black folks are racially incapable of following the laws. The cop clearly says, “I told him not to reach for it! I told him to get his head up!” -- but bigots don't want to consider what both sides are saying, or which is more plausible, they assume that an armed robbery suspect is more credible than the police, even when the evidence contradicts it. SOP (Standard Operating Procedures) for cops, when someone has a license to carry (and the cop has any concerns), is to tell them to NOT move, and then to disarm them before ID (or doing anything else), or having them get out of the car and then disarming before going through the rest of the routine: all to avoid accidents or worse. According to Lavish the cop didn't do that, told him to get his ID, then shot him for reaching for it. That stretches Lavish's credibility as much as the, "hands up, don't shoot" meme that's long been proven bogus. Video shows the gun resting on Philando's leg (a gun that looks like the one used in the robbery). That's not where you usually keep a gun when you have a license to carry (that's not how you're trained). It's also not where you'd keep one when a cop is coming to your window after pulling you over. It stretches Lavish's version a bit more. The family started a few Go-Fund-Me Donation sites (https://www.gofundme.com/2d8ryf34 1], 2, 3), so far totaling about $250K, and has done everything they can to sensationalize the story and their plight. Lavish can be seen smoking her favorite brand of Newports. There's also strong suspicion he was a Crips gang member (either past or present). While it's not proof, and I don't leap to conclusions based on one post from a secondary news site, there's reason to think a guy dressed in blue wearing a blue bandana, flashing gang signs, with facebook and twitter liking Crips and referencing them often, and his girlfriend (Lavish) claiming to love her crips man, might be a member. Even if not, the fact that the media has played up the innocent cafeteria worker angle, and ignored the rest of the backstory and the thugs life references, tells you a lot about their interest in getting to the whole truth. He was acquitted of all charges (including 2 black jurors). You want to see comedy read this -- the brightest legal minds at the NYT said that Castile did nothing wrong. Anyone with a clue and a conceal and carry, knows he did a lot wrong. (1) You don't carry in your pocket (as some are saying above), especially a sans-safety gun like a Glock. (2) You keep your hands on the wheel (10 and 2), and do NOT go anywhere near the gun, before or after informing the office you have one, you let them tell you what to do next. (3) You don't drive stoned with your wife and kid in the car, and with your car not in working order, along with 63 previous legal issues. That none of the best and brightest could point that out, shows that either none of the Journalists, fact checkers, or legal minds at the NYT have a clue... or they're intentional polemics lying to their base because they know their readership is just that gullible to not catch those obvious logical flaws. (I'm not cynical enough to assume #2. As they say, never attribute to malice that which can more easily be explained by incompetence. But man, this is incompetence incarnate). I'm NOT saying that we should jump to conclusions, either way. Don't assume robbery suspects and their families always tell the truth. Nor that the cops don't make mistakes. You have to avoid jumping to conclusions, and give both the stink test. (Which seems more plausible). Scenario A says a jumpy white cop shot a black guy for being black or reaching for his ID (which was next to his gun), after telling him to get his ID. Scenario B has an armed robbery suspects not following directions of a latino officer and reaching for his gun (or ID, which was behind the gun), and his girlfriend turns on her cell phone to get her academy award in a movie called, "bad shooting lawsuit". Even then, assuming either the cops are always wrong, or assuming the cops are always right, equally reflect only the bias of the viewer. Thus, we should wait and see. Not demand action based on unreliable testimony from either side. That's not what the race hucksters and activists did. Don't get the facts: react! The cop is being charged with manslaughter -- most of these cases are ruled not-guilty. Mostly because the bar is still pretty high to convict, but the racists will claim it's because the jury's are all racists. We'll have to wait and see what really happens, and what evidence there is. But now that the harm has been done, many are convinced there's an epidemic. The media will lose interest, especially if it turns out the cop is let off for justifiable reasons that they never bothered to share with the public. This page was last edited on 2 April 2019, at 01:20.